Our arts educators were inspired by our featured performers to design a series of activities under the big tent that are about, made of and powered by air! Children of all ages (and that means adults, too!) can explore the art and science behind wind-powered snakes and elephants, pinwheels, wind chimes and hot air balloons! Guest appearance by Pizzasaurs 6-8 pm! Free! Travel back in time to prehistoric Egypt and help Dr. Dino discover more about the largest land predator of all time— the Spinosaurus! Children will dig for fossils; discuss habitats, adaptations, and stratigraphy. Free! 4:30-5:00 Meet & Greet the Dinosaur! Learn all about dinos from the museum educators while taking a selfie with Spiny! Free! Kids! Join the baristas for an alternative "expression" of the coffee bean! Free! 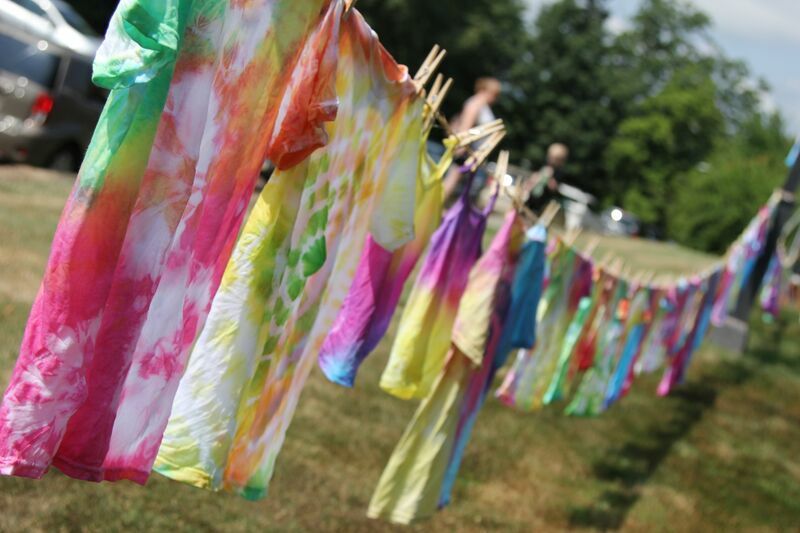 Tie Dye: Who doesn't like tie dye? Choose your own colors to create a wearable work of art with the assistance of our experienced staff! You can purchase a festival t-shirt for $5.00 or bring your own t-shirt and it's free! Chalk on the Walk: Got a Picasso or Michelangelo on your hands? Perhaps a budding Warhol or Keith Haring? Let your little artist color the sidewalks with their imaginations while you stop to enjoy the music! Free! Kindness Rocks: Help color the landscape with messages of hope, inspiration and positivity! We'll provide the supplies. You provide the creativity! Free! Facepainting: Join our friends from Slippery Rock University for free face painting!